Khaled Meshaal, the exiled political leader of Hamas, has called his first visit to the Gaza Strip his “third birth”. Khaled Meshaal had not set foot in the Palestinian territories since leaving the West Bank in 1967. The Islamist militant group has governed Gaza since 2007. Khaled Meshaal entered Gaza from Egypt at the Rafah border crossing, kissing the ground in celebration. Officials there said his wife had arrived late on Thursday. Khaled Meshaal is expected to visit the home of late Hamas founder Sheikh Ahmed Yassin, as well as that of Ahmed Jabari, the military commander killed in an Israeli strike last month. Ahmed Jabari’s death marked the start of an eight-day Israeli offensive which Israel said was aimed at halting militant rocket attacks. Some 170 Palestinians and six Israelis were killed. Hamas spokesman Sami Abu Zuhri said in a statement that Khaled Meshaal’s visit was “a fruit of the victory of the resistance over the occupation”. Khaled Meshaal is scheduled to address the rally in Gaza City and will talk about the organization’s future strategy towards Israel. In 2011, Khaled Meshaal and Palestinian Authority President Mahmoud Abbas – the Fatah leader – endorsed an Egyptian plan to reconcile the rival factions. Although attempts to forge a Palestinian government of national unity have since stalled, Khaled Meshaal told Reuters ahead of his Gaza visit that “there is a new mood that allows us to achieve reconciliation”. Khaled Meshaal was quick to praise Mahmoud Abbas’s recent success in upgrading Palestinian status at the United Nations to that of a non-member “observer state”. 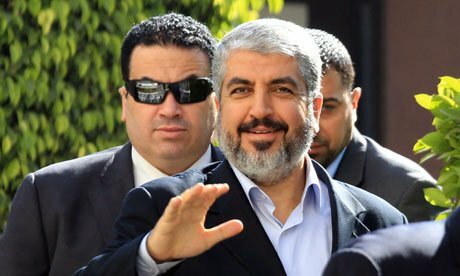 Correspondents say Israel – which along with the US and EU considers Hamas a terrorist organisation – appears to be turning a blind eye to Khaled Meshaal’s visit. “We have no position on different individuals within Hamas,” he said, according to AP news agency. On Thursday, Palestinian workers were setting up a stage for Saturday’s rally that included a replica of a type of rocket Hamas has fired into Israel. “Made in Gaza,” was written on it. Khaled Meshaal was born in the West Bank in 1956. He moved to Kuwait after the 1967 Middle East war and later Jordan, where his involvement with Hamas began. Khaled Meshaal survived an Israeli assassination attempt in Jordan in 1997 and was briefly jailed there, before being expelled and travelling to Qatar. He became Hamas’s political leader in exile in 2004 when Sheikh Yassin was assassinated by Israel. Khaled Meshaal ran operations from Damascus until February this year, when the unrest there prompted another move. He now bases himself in Qatar and Egypt. Hamas was created in 1987 after the beginning of the first intifada – or Palestinian uprising – against Israel’s occupation of the West Bank and Gaza. Under its charter, Hamas is committed to the destruction of Israel. But the group has also offered a 10-year truce in return for a complete Israeli withdrawal from territories it occupied in 1967.